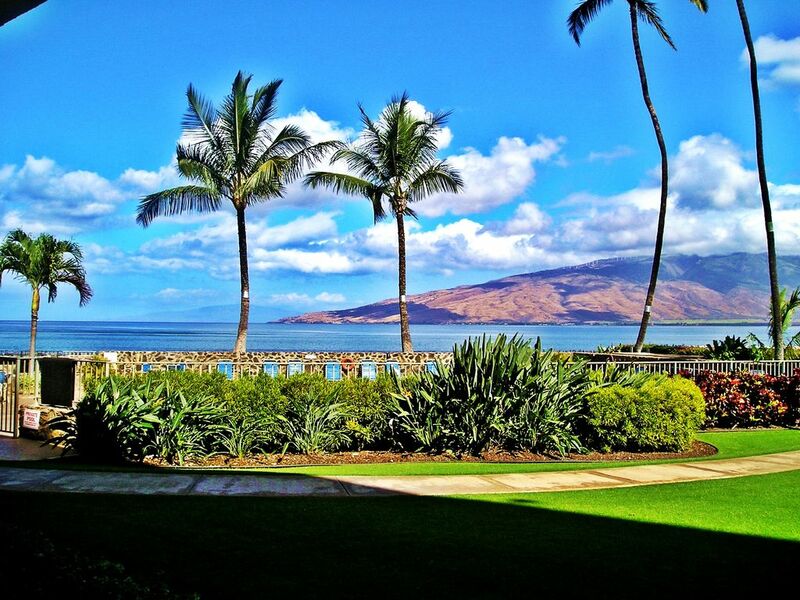 Soak up amazing ocean, mountain and sunset views at our beautiful oceanfront condo, on the sunny Kihei coast. We are just steps from the beach, and visitors can swim safely in the protected ancient Hawaiian fishpond that fronts the condo. Our non-smoking ground floor condo is perfect for couples or families, as well as the elderly or infirm. The unit has been recently remodeled to provide all the comforts of home. There is a queen size bed in the master bedroom, twin beds (which can be made into a king) in the second bedroom and a queen sofa sleeper in the living room. The kitchen is fully equipped for all your needs. Cable TV and DVD player with fast and free wi-fi. Ample linens, including beach towels, are provided. Enjoy beach time with beach toys, cooler, umbrella and beach chairs. Wake up to the sound of the ocean as the morning sun lights up the West Maui Mountains. Enjoy stunning views from your living room, bedroom and private lanai. Watch wind and kite surfers, stand up paddle boarders, Maui's dramatic sunsets, and the lights of Maalaea Harbor. In winter months, from your lanai, look for humpback whales breaching offshore! Menehune Shores has immaculately maintained grounds, with a solar heated pool, shuffleboard court and outdoor barbecue grills. More barbecues, picnic tables and spectacular 360 degree ocean and mountain views are accessible on the rooftop garden. Aloha and welcome to Maui! We are your hosts, Sande and Bob. We are celebrating seventeen years at Ocean Breeze Hideaway! We thank all of our guests from around the world for contributing so much to our lives. We have lived in Hawaii for twenty six years and take special pleasure in creating an environment that will enhance your well-being and relaxation. We are available to answer questions and direct you to the finest restaurants, secret spots, a relaxing massage, or whatever your heart desires.We are happy to share our love of this island with you. The exquisite and peaceful ground floor oceanfront location, just steps from the beach as well as the perfect place to watch the spectacular Maui sunsets, and, additionally, the ancient Hawaiian fishpond, sold us on this condo's location. We began coming to Maui in the 70s, always staying in this same area, out of the bustle of Kihei, yet centrally located. We love this area so much that our Maui home for the past seventeen years is 5 minutes from the condo. Unlike most condo owners who live on the mainland, we live on this beautiful island. We are nearby, available to answer your questions. Beautiful oceanfront sunset view; ground floor access to beach, oceanfront pool (heated) and gas barbecues oceanside, as well as on the roof with 360 degree view, located on an ancient Hawaiian fishpond; 2 shuffleboards, just a short walk to Maui's longest beach for an early morning or sunset walk, easy access to many beautiful beaches, great restaurants and shops. This is a non-smoking condo. Air conditioning and ceiling fans in the living room and bedrooms keep our guests comfortable. There are no roads or buildings, just the spectacular ocean view from our unit. Our condo's location is perfect for families, two couples, and is suitable for the elderly or infirm. Twin beds in the second bedroom can be made into a king bed. Wireless internet is fast and free. Enjoy watching the turtles, and the rainbows. Humpback whales can be seen from the condo December to April. Located 20 minutes from the airport, close to the Maui Ocean Center, Ma'alaea Harbor, Wailea, Lahaina and 'Iao Valley. Actually fronting the Pacific Ocean, the water is easily accessible from our unit. Beaches stretch north and south from Menehune Shores. Kalepolepo Beach Park is just steps from the condo and easily accessed from our ground-floor unit. From the rooftop lanai at Menehune Shores, a 360 degree view offers views of Haleakala Crater, the West Maui Mountains, the islands of Lanai and Kaho'olawe, and Molokini Crater. Our condo unit faces northwest, for amazing views of our incredible sunsets. Sit on your lanai and relax into the changing colors of the evening. An ancient Hawaiian fishpond lies just offshore from the condo and offers a calm and safe place to swim, and snorkelers often see turtles in the pond. A landline is provided for local calls. Sheets, pillows and pillowcases are all provided. Includes kitchen, bath, hand and beach towels. Not necessary to access our groundfloor unit, but useful to get to the rooftop picnic area. The living room seats 5 or more people comfortably, with more seating available, for watching a movie, "talking story", or enjoying a drink and sunset. A dining table and chairs are located between the kitchen and living room. The lawn outside the unit features a shuffleboard court. Outrigger canoe club nearby as well as kayaks, paddleboards, and surfboards to rent. On the rooftop are more barbecues and picnic tables where you can enjoy drinks and dinner with a spectacular view of ocean and mountains. Join the daily sunset celebration on the rooftop. Although not provided by us, there are plenty of beach toys left by previous guests, including children's water toys, boogie boards and snorkel gear. The pool is located just steps from our condo unit and is accessible by key or passcode to condo residents and guests only. Beach towels, cooler, umbrella, beach chairs, non-smoking, ceiling fans, air conditioning. The condo was ideally situated with terrific access to the beach as well as multiple dining and shopping options. The condo was well equipped and in nice condition. We had a great time. Thank you for your review. We're so glad you enjoyed your stay at our condo. Absolutely beautiful and very well located location ! Had an amazing stay at the very well supplied condo and loved being on the first floor with the beach right there! Only thing that was a little annoying was the gardeners mowing the lawn so early in the morning. We didn’t see many staff members and the one gentleman we saw wasn’t very friendly and just asked us to move something that was hanging on the bushes which I completely understood but his approach was a little rude and gave no explanation nor did he even introduce himself. May just want to be a little more approachable and I know that has nothing to do with the owners of the condo because they were amazing to work with. I still wanted to share my thoughts on that though since the staff is a representation of the condos. Thanks for your review. We are glad you enjoyed your stay at our condo, and enjoyed the amenities we provide and our condo's location. In order to maintain the grounds of the complex as impeccable as they are, the gardeners begin working early, before it gets too hot in the day. We are sorry you did not see the clothes rack, used for hanging up wet articles outdoors. Thanks again for choosing to stay with us! Aloha! The condo was perfect for our stay! Because of its central location, it is a great starting point for day trips around the island. All the equipment needed for days on the beach was much appreciated. The condo and grounds are beautiful. Everything you need is provided. The grills were great for cooking and meeting people at the end of the day. The beach in front of the condo was Turtle Town! We snorkeled with many turtles and fish. Watching the whales from the lanai and roof deck was amazing. We truly had a great stay! Mahalo! Aloha & Mahalo for taking the time to write your great review! Thanks also for taking such good care of the condo. We hope you will become one of our return guests! Thanks again. We loved staying at this condo. The ground floor access to the beach was perfect! I can see coming back with my mom and grandchildren. The home had every amenity you could ask for, had we stopped at the house before the store we could have saved money!! I was so in love of the view from the master and common space. Check in was easy. Having a washer and dryer saved taking wet things back on the plane. This condo is centrally located to enjoy the island! The snorkeling outside of the condo was amazing!!! We spent the first day going to our traditional spots, then realized that right outside the condo had everything you wished to see! The turtle super highway at sunset was a thrill! Especially that you could stand in below the knee deep water and watch them come in!!! A true treat!!! We saw octopi, eels, tons of fish, sea urchins and of course lots and lots of turtles! Thank you, Bob and Sande for providing such a great home to make memories from! LOVE LOVE LOVE the view from this condo! We have put our heart and soul into making the condo into a home that we would want to live in.Reading this review feels extremely rewarding. You captured the essence of what we hope to accomplish... a place our guests call home, appreciation and love for the beauty surrounding our convenient ground floor condo. Thank you from the bottom of our hearts for your great review! We look forward to your return with your mom and grandchildren. The unit was very clean and comfortable for our family. We enjoyed the walks along the beach. The beach area was protected and great for children. Would definitely recommend this vacation rental. We are glad you and your family enjoyed staying at our condo. The location is perfect for families, and the beach and ocean are well protected and safe for children. Thank you for choosing to stay with us, and for your great review! One of the best vacations we have taken! The condo was absolutely perfect for our trip. We enjoyed lazy days at the beach and easy access to dinners out. We immediately felt at home, the condo had everything we needed. The views are amazing and thankfully we had perfect weather. We can’t wait to book our next trip!! We are happy to hear that our condo was perfect for you, and that you thoroughly enjoyed your vacation! Our intention is to provide the best possible environment for guest to feel comfortable and at home, and we look forward to your return. Mahalo for your great review! No refund if cancelled less than 60 days prior to arrival.